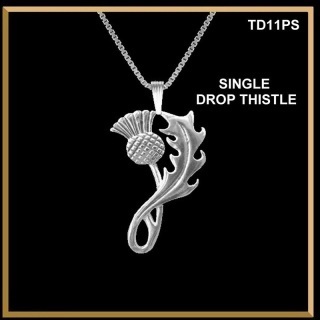 This exquisite single thistle is the matching pendant for the double headed thistle brooch. Alone or as a set, this National emblem of Scotland would make a perfect gift to be treasured now and forever. Measurement: 1-1/4" by 5/8" (32mm x 16mm). This lovely pendant is custom made in sterling silver, 10K gold or 14K gold in our Studio by hand. The sterling silver pendant includes a sterling silver chain. In gold the chain is extra.